RockShip game submitted to AppStore. Boomerang game won JavaOne 2006//CODE:MOTO contest. Various games and applications from us. 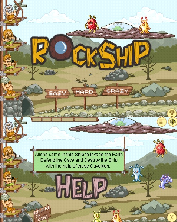 RockShip is an iPhone/iPodTouch game. Aliens are Invading the Earth. You are the only hope of the last standing Cave Men. Help them to defeat the Aliens and defend their Cave. Very soon it will be available from Apple's AppStore. Boomerang is a 2D puzzle game. Game goal is, you as the caveman, should construct the bridge to cross the river. 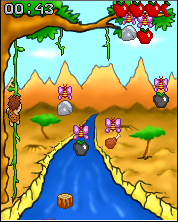 In order to do that you have to collect various objects by hitting the butterflies using your boomerang. Very simple and easy to use Tip Calculator. 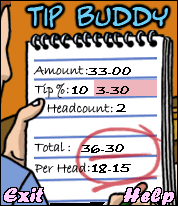 Unlike most of other Tip calculators, TipBuddy has a Nice UI that gives a refreshment to your eyes. 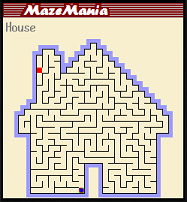 Plain old Maze game. The interesting part is this game creates mazes in various shapes and randamizes every time you play. Copyright (c) 2005-2007. ExCellApps Inc. All rights reserved.